Over the years I’ve gained mixed impressions of Sheffield. It was neighbouring Rotherham that I encountered first, so one might think the only way was up from there. Arriving at the city’s station for a university interview, the image which etched itself on my memory was of the Le Corbusier inspired Park Hill Estate and a shabby indoor market opposite the exit. It was a far cry from the Georgian splendours of Bath where I grew up. The Sheffield of 2014 is quite unlike the one I experienced in the early nineteen-nineties. Civic areas have been spruced up, the covered market is gone and Europe’s largest urban glasshouse now graces the city centre, home to a collection of more than 2000 plants from around the world. Today’s Sheffield feels smart, clean and cosmopolitan, fitting back into the position it once held as one of Britain’s leading urban centres. 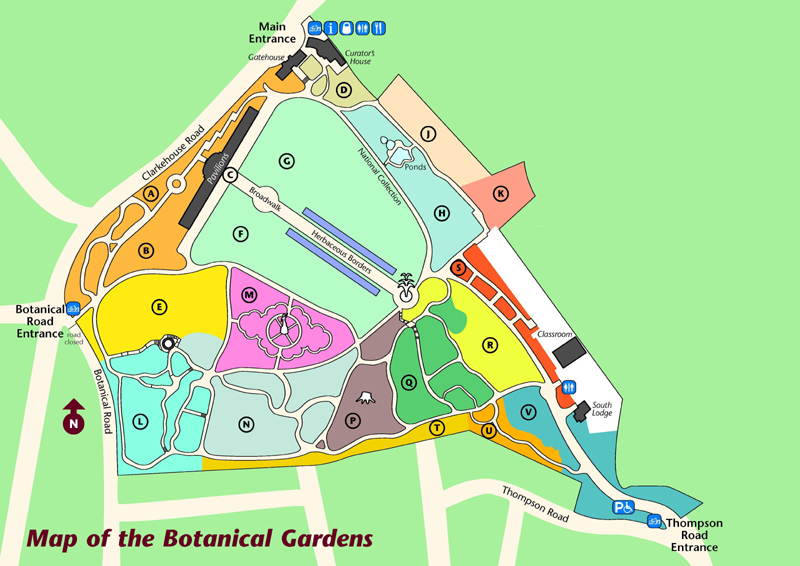 The city’s botanical gardens were laid out in 1836, when Sheffield was approaching its industrial heyday. Leading horticulturalist of the moment, Robert Marnock, was called on to design the 19 acre site in his trademark ‘Gardenesque’ style. (This vague term, coined by John Claudius Loudon, refers to a clearly contrived but non geometric layout of serpentine paths, garden features and clumps of trees.) In the beginning the gardens were only opened to the general public on four days each year; otherwise admission was granted only to shareholders and annual subscribers. Like many other high maintenance Victorian pleasure grounds, the gardens were costly to maintain and suffered many periods of decline throughout the 20th century. By the early nineteen-nineties, when I was first introduced to Sheffield, they had become something of a no-go area. The elegant range of glasshouses and pavilions that preside over the gently sloping site were by now in a critical state of disrepair. In 1996 a Heritage Lottery grant of over £5M, combined with local fundraising and labour in kind, was sufficient for an ambitious, full scale restoration to begin. It was an important moment for historic parks across the country, many of which were in a similar predicament and looking for inspiration. Sheffield Botanical Gardens were officially reopened on September 1st 2003 by HRH The Price of Wales. 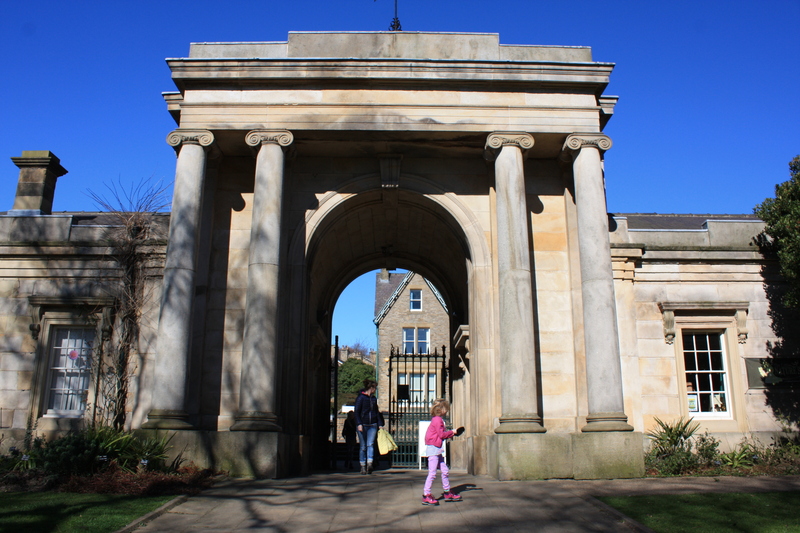 Pictured above is the magnificent Ionic entrance gate, designed by Benjamin Broomhead Taylor. Apart from an unsightly but necessary preponderance of asphalt, Sheffield Botanical Gardens must now recall a standard that their Victorian creators would recognise. There’s eye-poppingly colourful carpet bedding in front of the main glasshouse range; carpets of jewel-like crocuses in the rolling lawns; an extensive collection of mature trees and a new, terraced Mediterranean area. A Victorian bear pit, which until the 1870s housed two bears, can still be explored, rather more safely than when it was originally constructed. The gardens are now home to National Collections of Weigela, Diervilla and Sarcococca, whilst the Grade II* pavilions provide protection for an extensive selection of exotica from the warm temperate regions of the world. 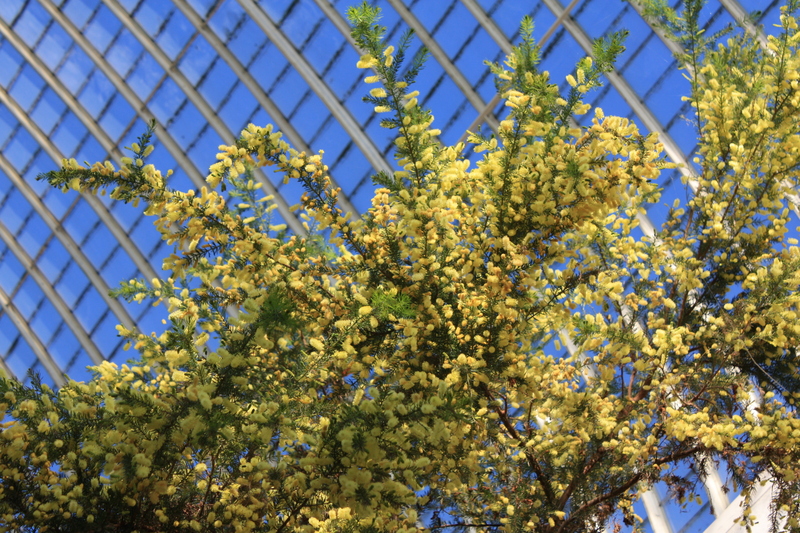 Below, the curvilinear roof of the central pavilion is seen through a haze of mimosa. I would like to go back to Sheffield Botanical Gardens again, to see the wide herbaceous borders in full bloom, or in autumn to witness the leaves changing colour. 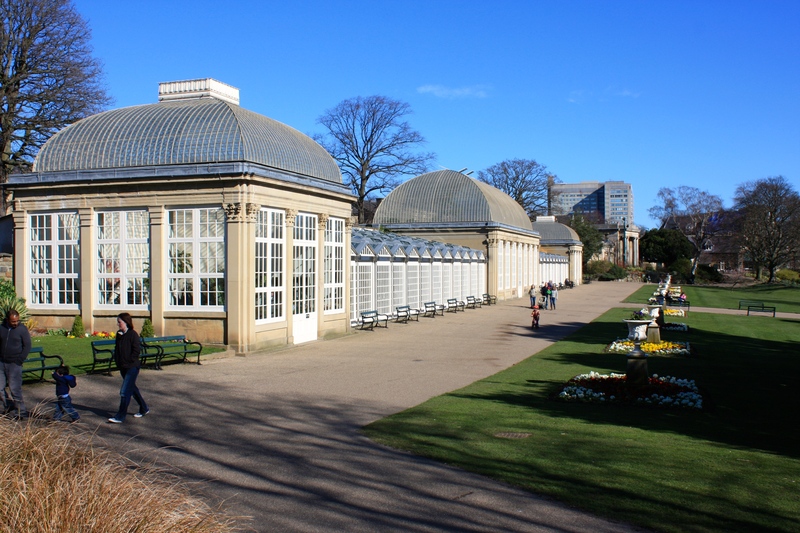 Whether the botanical gardens now have the city they deserve, or the other way around, it matters not; they are a great credit to the Sheffield Town Trust, the Friends of the Botanical Gardens (FOBS) and all those who work on their ongoing development. 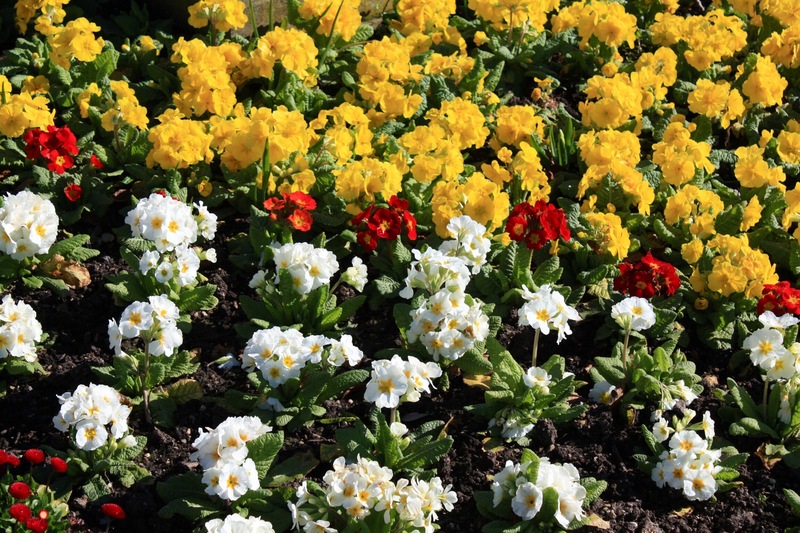 Follow this link to the Sheffield Botanical Gardens website. 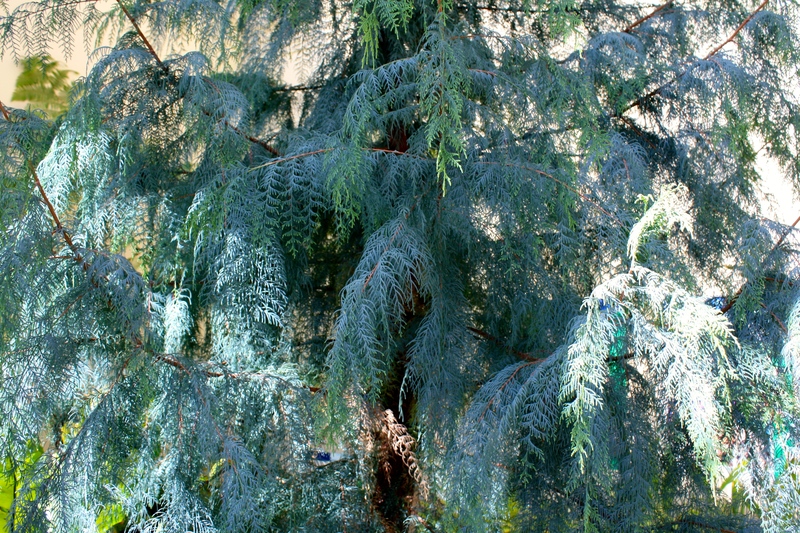 Cupressus cashmeriana (Bhutan cypress) – a native of Bhutan and parts of Arunachal Pradesh in north eastern India. Not quite hardy in the UK, so living a languorous life in the warm shelter of the pavilions. The fine, draping, bluish foliage is exceptionally elegant. Cardamine pentaphylla – Here today, gone tomorrow, the lilac pink flowers of the showy toothwort appear fleetingly in spring before dying away. 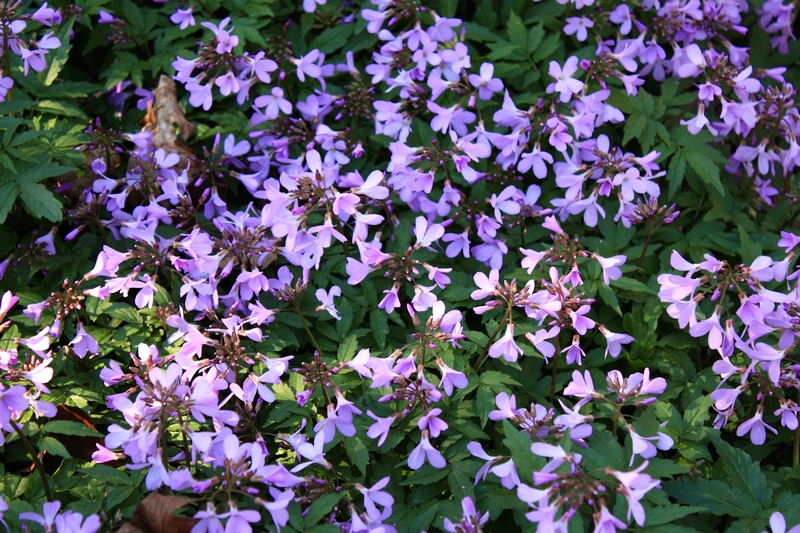 Spreads to create a carpet of flowers in a woodland setting. Primula elatior, the oxlip – rarely encountered in the wild beyond East Anglia, this pretty native primula likes nutrient-poor, calcium-rich damp woods and meadows. Broad carpets of these delicate flowers faced the sun in the Marnock Garden (K on plan below). 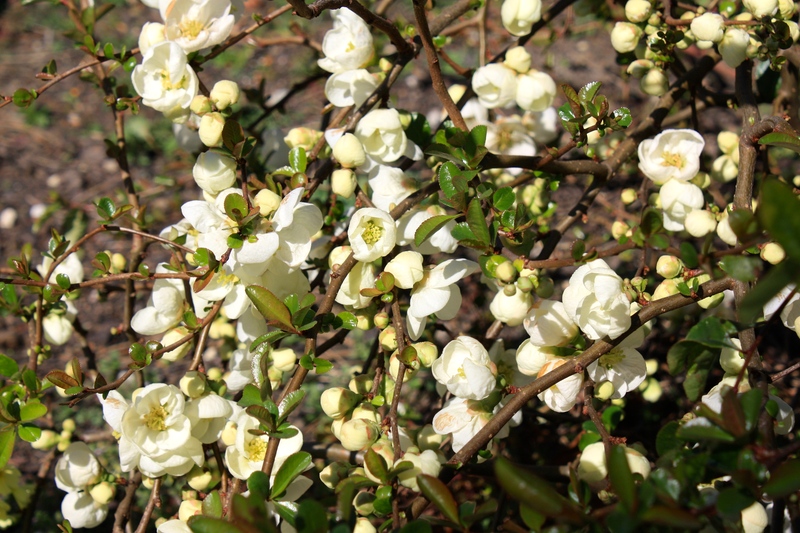 Chaenomeles x superba ‘Jet Trail’ (Japanese quince) – bears pure white cup-shaped flowers from February to May. Edible golden fruit ripen in autumn and are suitable for making jelly. 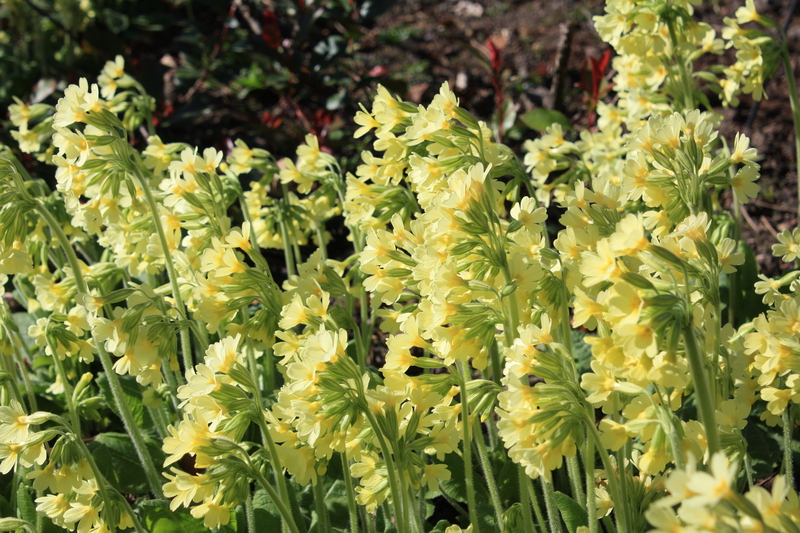 This one’s going on my list for the primrose garden at Trevoole. 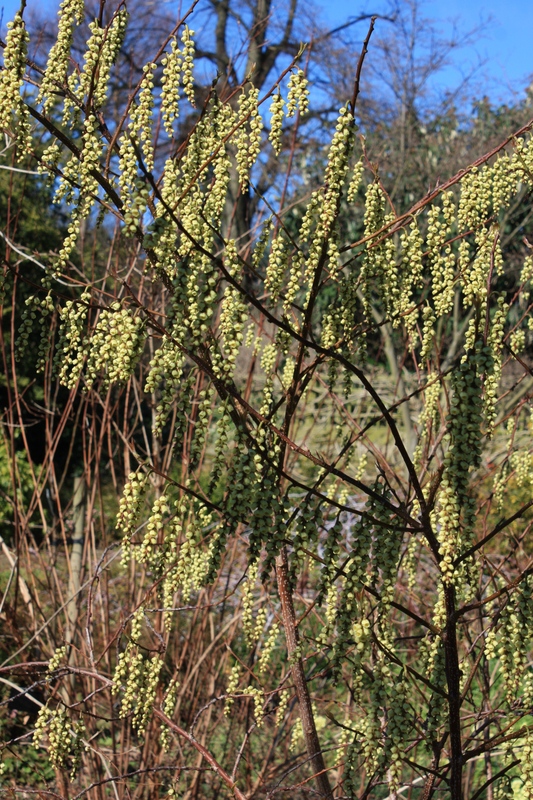 Stachyurus praecox – one of my absolute favourite spring flowering shrubs. Racemes of sparking lemon-yellow flowers dangle elegantly from sparse stems. Plant in open space so the colour can be appreciated against a fine blue sky, or against a backdrop of dark evergreen foliage. 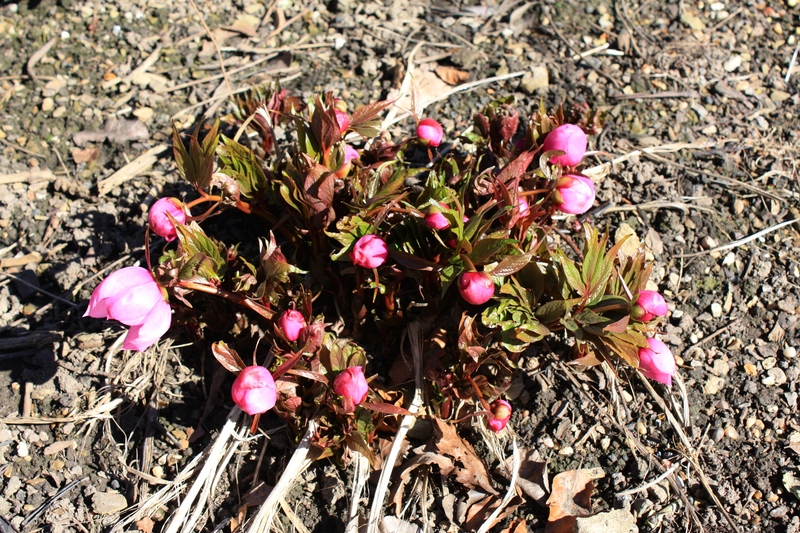 Paeonia obovata – I didn’t expect to encounter peonies in March, but the Japanese forest peony wastes no time in producing its lipstick pink blooms. Here they emerge from the skeletons of last years fallen foliage. Avoid deadheading after flowering to guarantee a colourful display of seedheads. 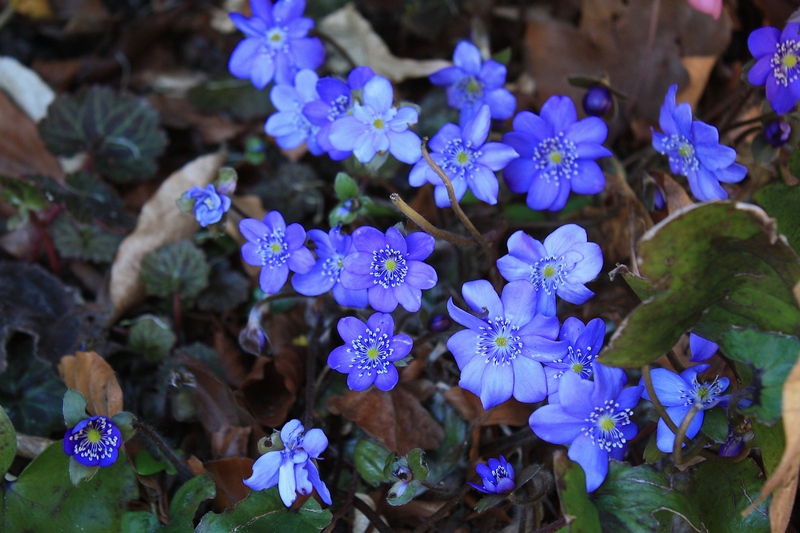 Hepatica transsilvanica (liverwort) – It’s easy to see why gardeners fall in love with this eye-catching perennial. Hepaticas are tolerant of alkaline soils and will cope with a wide range of conditions, from shady deciduous woodland to scrub and grassland in full sun. Thank you for this post, it is of particular interest to me because I grew up in the Peak District just outside Sheffield and I remember visiting the Botanical gardens quite often as a child. It is wonderful to see how they have been smartened up. I haven’t been for many years but perhaps now is the time to revisit. I love Stachyurus praecox too. I don’t know why it isn’t seen more often. I’d definitely recommend a visit. The labelling isn’t brilliant, but there’s a genuinely excellent collection of plants and the standards are really good. The whole area around there is really smart too. What a great post, thanks for sharing.